On the back of the inspiring ‘Rise of Good Tourism’ session during the PATA 60th Anniversary & Conference earlier this year, UNESCO has launched the project “Good Tourism” in China. 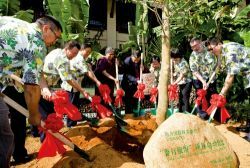 The ‘Good Tourism’ project was launched at the beginning of this month in Yanoda, China to encourage beneficial and supportive interaction among travellers, tourism policy-makers, entrepreneurs, tourism operators, managers, scenic spots and local communities in the county. According to UNESCO Programme Specialist for Culture, Beatrice Kaldun, the purpose of the project is to pursue the sustainable development of tourism. The concept, first introduced at the PATA 60th Anniversary & Conference in Beijing, April 2011 consists of a new balancing concept following eco-tourism, green tourism, low-carbon tourism and responsible tourism. PATA Chief Executive Martin Craigs said they are thankful for UNESCO’s initiative to promote the PATA concept of ‘Good Tourism’ in China. "The days of labelling tourism based on its particular contribution for example, environment, community or local heritage are receding,” Mr Craigs said. The implementation of the Good Tourism project will take around two years and will be supported by the Hainan Provincial Tourism Development Commission. Additionally, the Yanoda Rain Forest Cultural Tourism Zone will become the first research site for the project and will also offer funding and support for the projects implementation.